Sometime ago I posted on my Facebook page that I was planning on offering free wallpaper. The frequency of the wallpaper will be one new free wallpaper per month. I am going to try to update the wallpaper on the first of each month, so I am running a few days late. So here is the free wallpaper for the month of June. I hope you enjoy. About the image. 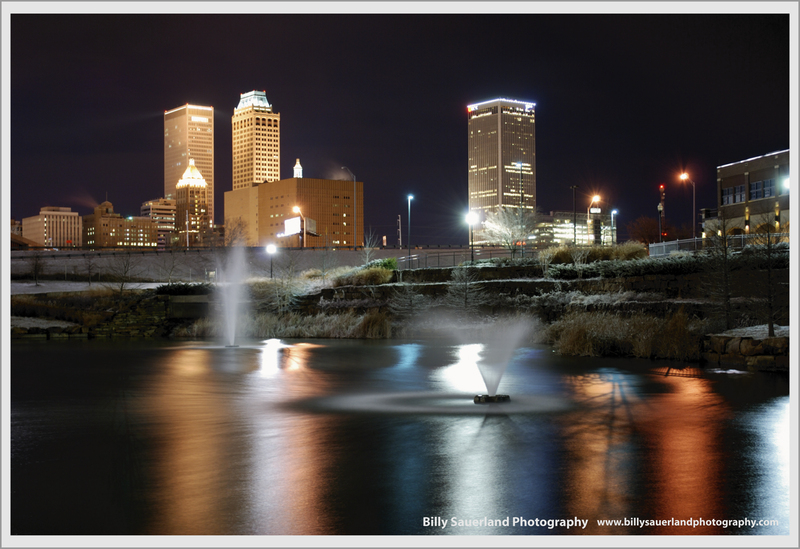 On the night that Tulsa actually received a few inches of snow, I went out to capture some images. One in particularly I wanted to make was of Centennial Park and Downtown Tulsa. So there I was that night, sometime around curfew, (I was not there after curfew) freezing cold and with a friend that wanted to get out of the house. With our stocking caps and mittens trying to make some images, this is what we came away with. I went out to capture an image of Tulsa in the snow, the one night of snow we had all winter, and this is what I was able to come home with. Click the above image then right click and save-as or just click then click and drag to your desk top. Come back often to check on new post as well as more new stuff. Thanks! ← Sense memory! A way to revisit.